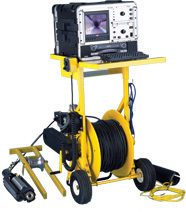 Ratech developed the Portable Mini-Mainline© for small to medium sized municipalities and contractors looking for an affordable entry level mainline video inspection system. This portable format means off-road hard to access areas are no longer a problem. Simply unload the system and roll it to the work site. The portability of the Mini-Mainline system is ideal for those difficult access areas such as easements and ravines. Although portable, the Mini-Mainline system can easily be loaded into a standard cargo van or trailer. It can then be off-loaded as required at the inspection site. The system is also easily broken down to fit in a small minivan or the trunk of a large sized vehicle. The unique design allows the operator to monitor the video picture safely away from the manhole instead of having to work directly in front or near it. An optional removable monitor tray table makes it convenient for the operator to comfortably monitor the inspection in an off-road situation. For you convenience the mini-mainline is available with either our torpedo crawler, RST crawler, or standard RCT-310S tractor.